Another basic geometric shape that's handy to know is the circle! 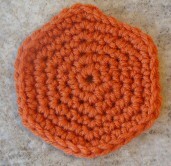 To be perfectly honest with you, though, the circle, as it is usually seen in crochet, isn't a circle at all - it's a hexagon. That's because by evenly placing six increases in a round or single crochet, you can produce a flat piece of fabric that's near enough to round to pass for circular. More increases, and your work begins to ruffle; fewer and it peaks a little in the center. If you look here at the back, though, it looks very circular indeed. Anyway, what follows are directions that will allow you to make a circle of any size you please - large or small - with any yarn and any hook you like. There are several ways to begin: one method recently popularized is the Magic Ring (there is a truly excellent photo tutorial here at Crochetme). Another is to make four chains and join them in a ring by slip stitching into the first chain, then working into the ring created by the chains. The third method is to chain two (or three or four if you will be working with double or treble crochet) and make your stitches directly into the second (or third or fourth) chain from the hook. However you begin, once you have a place to start your circle, work 6 single crochet into your starting point. As was discussed in Working in the Round, you can choose either to join your rounds or work in a spiral. Either way, each round should contain six more stitches than the row that preceded it. Each row thereafter would increase the number of single crochet worked before the increase by one. So, in round 4 you would make two single crochet before the increase, but in round 7 you would make five. Are you ready then? Go on over to the Simple Circle Hat and try it out! Copyright 2007-2008 Melissa Mall. All rights reserved.